Sleep is extremely important. If you aren’t getting enough quality sleep, your life can suffer in many areas. I have had issues with chronic back pain and insomnia for years. My work, my relationships, and even my sanity were being affected daily because of not sleeping comfortably. As a result, I have tried many different types of beds and bed bases from a wide variety of brands. I wish I had known about the Classic Brands Adjustable Comfort Bed Base at the height of my back pain and insomnia as it would have saved me many sleepless nights. Adjustable beds have taken the market by storm offering a more comfortable night’s sleep at better prices than ever before. While the designs of these beds vary, they typically allow the user to lower or raise the areas of the bed under both the upper and lower body as needed. This allows for a customized sleep experience in which you can find the best, most comfortable sleeping position. This type of bed can be extremely helpful for people with pain, insomnia, a variety of illnesses, or just those seeking a more restful sleeping experience. An adjustable bed consists of a mattress and a bed base. No box springs are needed. While some companies sell adjustable beds as a combined product, most sell them separately. This means you must purchase a mattress as well as an adjustable base. Adjustable beds may make noise when the adjustment motor moves from one position to another. If you share your bed with someone, this could wake them or you. Some models have quieter motors than others. Some bases can move each side of the bed independently so your partner can be free to select their own sleeping preferences. The bed bases can be quite heavy. They can vary in weight from 100 to 700 pounds, not including the mattress. This could make moving difficult, so it is important to think about your living situation when looking at different options. The Classic Brands Adjustable Comfort Bed Base has a sleek, modern design that offers modifiable support to your mattress. This base has the added benefit of being complimentary to latex and memory foam mattresses in addition to traditional adaptable position spring mattresses. This sets this choice above other adjustable bed manufacturers since you have greater freedom in choosing the best mattress for you instead of having to settle for the one they sell with a similar base. This option also includes a wireless remote, USB charging ports, and a massage function. The Classic Brands Adjustable Comfort Bed Base is an excellent choice for people that suffer from insomnia, sleep apnea, Gastrointestinal Esophageal Reflux Disease (GERD), heartburn, acid reflux, chronic pain, and many other conditions. This bed base is great not only for sleeping but for watching television, reading, working on your laptop or tablet, relaxing. With the use of this base, you can finally get a restful night of sleep or feel comfortable while relaxing. The Classic Brands Adjustable Comfort Bed Base comes with a variety of features and benefits. It also has some options that other bed bases do not. We’ve broken them down to explain how these benefits will help you and which features truly stand out. This bed base goes high tech with a wireless remote. 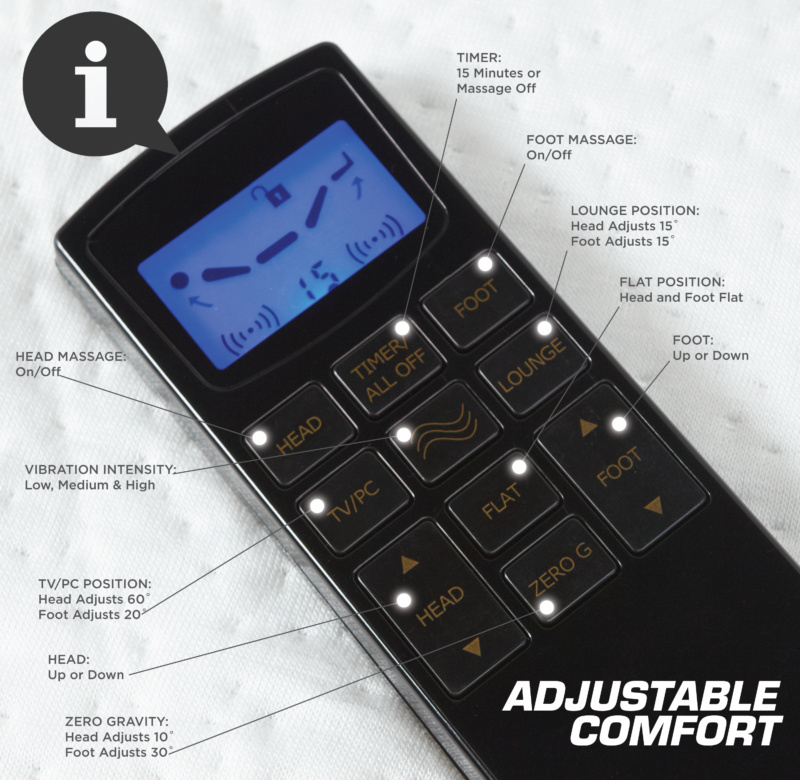 The remote has four preset positions, massage controls, and control allowing you to move the head and foot portions of the bed manually. The remote is easy to use and syncs quickly upon set up. In addition to being able to manually raise and lower both the head and the foot of the bed from the wireless remote, the Classic Brands Adjustable Comfort Bed Base also has several preset positions. 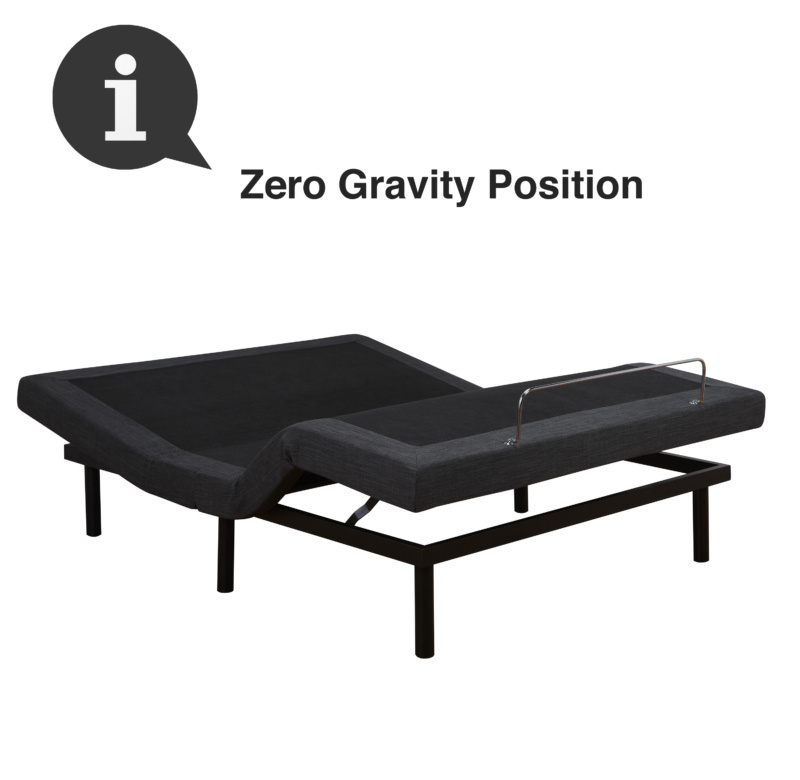 The Zero Gravity preset puts the head of the bed at 10 degrees and the foot of the bed at 30 degrees. The preset for TV/PC position moves the head to 60 degrees and the feet to 20 degrees. The Lounge position puts both the head and feet at 15 degrees. The bed also has a preset for a Flat position with both the head and feet returning to a completely flat, traditional bed position. You can also feel free to find your own favorite position by using the remote to manually raise or lower the bed to wherever you feel most comfortable. The varying positions can help you feel more relaxed and comfortable so that you are able to get the rest you need. The positions can also help with medical conditions like heartburn and acid reflux which will benefit from having the head of the bed raised higher to prevent acid reflux. For those with back or leg pain, elevating the foot of the bed can help relieve pain and pressure. The Zero Gravity position helps to lower blood pressure, decrease strain on the heart, improve blood circulation, and decrease back pain. The Classic Brands Adjustable Comfort Bed Base has a massage function that allows you to choose the best level of vibration to soothe away pain and stress. 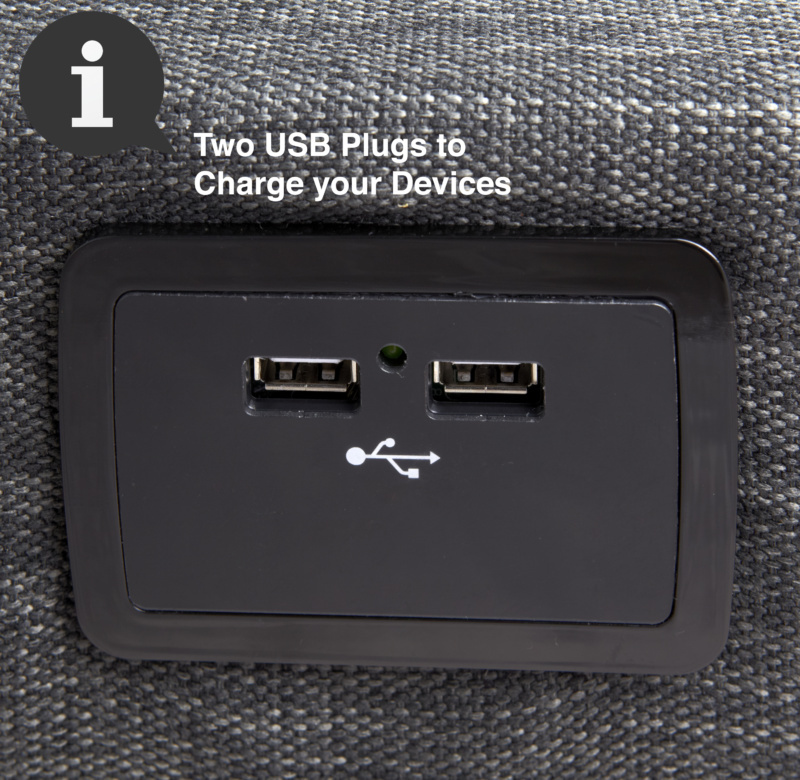 The bed base also has USB chargers that allow you to charge your phone, tablet, and other devices while you relax without worrying about finding your charging cord. It also puts your safety first with an extra two legs bringing the total to six legs to ensure even weight distribution and prevent the bed from collapsing. The bed base can hold an equally distributed total of 1000 pounds. The height of the Classic Brands Adjustable Comfort Bed Base can be changed with one of three different adjustable leg heights of 4 inches, 6.5 inches, or 10.5 inches helping it to fit in almost any setting. The foot of the bed base has a special mattress bar to prevent your mattress from sliding around. The bed base is also extremely easy to quickly set up so you can start relaxing in no time at all. The Serta Motion Essentials II Adjustable Foundation is another reputable option. This bed base holds up to 650 pounds and has a wired remote. This option does not come with a massage function, preset positions, or USB charging capabilities. It also costs over twice the amount of the Classic Brands model. This base would be best for someone who wants just a basic bed base without extra features. The Sealy Ease Adjustable Base offers a wireless remote and can hold up to 650 pounds. While it is comparable in price it lacks preset positions, a massage function, and is designed to work with Sealy brand mattresses instead of a variety of brands. This base would be best for someone who already owns a Sealy mattress and does not want any fancy extras. The Dynasty Mattress Split King with 12″ Cool Breeze Gel SCape Adjustable Performance Base Set includes an adjustable base, a 12-inch gel topped memory foam mattress and wireless remotes. The bed has a massage function and a variety of positions. While this option includes mattresses, it is over four times the cost of the Classic Brands model. You are also unable to choose a mattress firmness other than the medium to firm one provided unless you purchase an additional mattress set. This set would be good for those who like a firmer bed and do not want to shop for a mattress separately. Take a moment to check out these alternatives and let us know in the comments if you have slept on any of them. We also have an in depth comparison of the Classic Brands unit with the Leggett and Platt S-Cape here. In closing, the Classic Brands Adjustable Comfort Bed Base is a revolutionary answer to your sleepless nights. With preset positions, manually set positions, a wireless remote, massage function, USB charging ports, and adjustable leg height it is truly in a class of its own. This bed base is not only designed to help you get a great night’s sleep, but it has many added medical benefits. This adjustable bed has preset positions to aid in decreasing heart strain, alleviating leg and back pain, lowering blood pressure, lowering acid reflux, and so much more.